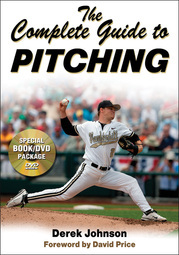 True to its name, The Complete Guide to Pitching is packed with guidance and instruction on every aspect of pitching. In this book and DVD package, renowned pitching coach Derek Johnson shares his secrets on mechanics, pitch selection, arm care and conditioning, fielding, and mental strategies for dominating the opposition. There is more to becoming a great pitcher than sound mechanics, a blazing fastball, and a live arm. A pitcher must know how to pitch—what to throw, when to throw it, and where to locate it. He must have a me-versus-you mind-set, that unique blend of confidence and determination that fuels a passion to set the tone of the game, own the mound, and shut down the opponent. From pregame warm-ups to cultivating the pitcher–catcher relationship, it’s all here in this one-of-a-kind book and DVD package. Featuring skill instruction, development drills, exercises, personal insights, and instruction on every aspect of pitching, The Complete Guide to Pitching is a must-have for every pitching coach, pitcher, and baseball fan. Derek Johnson, named college baseball’s National Pitching Coach of the Year in 2004 and National Assistant Coach of the Year in 2010, is widely considered one of the top pitching coaches in the country. In October 2012, he accepted a position with the Chicago Cubs as their minor league pitching coordinator. Before his appointment with the Cubs, he spent 11 years as pitching coach at Vanderbilt, three as associate head coach. While at Vanderbilt, four of his last five staffs led the Southeastern Conference in earned-run average (ERA). His staffs were also ranked nationally at number 15 (2003), 7 (2004), 17 (2005), and 13 (2007). More than 25 of Johnson’s past pitchers have been drafted. Under Johnson’s tutelage, Vanderbilt participated in the College World Series in 2011, led by eight players who would later be selected in the Major League Baseball draft, including first-round picks Sonny Gray and Grayson Gravin. The 2011 pitching team led the Southeastern Conference in ERAs and strikeouts. In 2010, the Commodores allowed the fewest home runs in the league, led by Sonny Gray, who was named Baseball America’s Summer League Player of the Year (the Commodores’ third win in five years). For his efforts with this team, Johnson was named the ABCA/Baseball America Assistant Coach of the Year. Johnson's 2007 crew led the SEC in eight statistical categories, including ERA (3.55), strikeouts (632), opponents’ batting average (.238), complete games (7), and runs allowed (266). Vanderbilt hurlers also threw a school record 606.2 innings in 67 games with 13 saves. Six pitchers from that 2007 staff were drafted and signed into the professional ranks, led by number-one overall pick David Price (Tampa Bay Devil Rays) and the eighth overall pick, Casey Weathers (Colorado Rockies). Johnson lives in Nashville, Tennessee.